After working eight days straight I finally had a day off to myself last week, and what a day it was! I can’t quite believe that November here and I’ve been out *sweating* in a t-shirt and leggings in the garden! The sun is still warming the earth and some of my spring flowers are a little confused, and I’m not surprised. Still, it’s given me a chance to do some catching up. The heleniums, echinacea, lavender and crocosmia have all been cut back now, and the compost heap has been filled with the remnants of summer and early autumn flower beds, asparagus tops, lawn clippings and shrub prunings. Of course there’s still so much more to do but I have the feeling that this year, we’ve just about kept on top of things ahead of the big winter sleep. 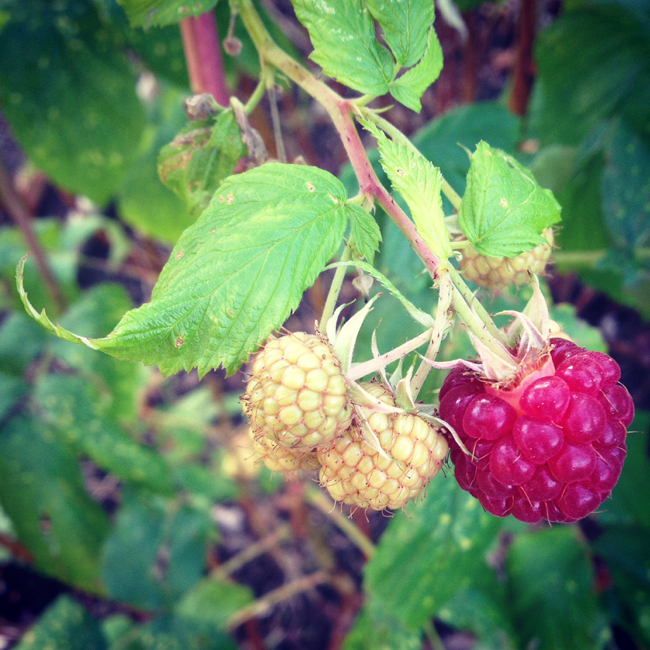 The summer raspberries are even still fruiting, with a few canes hanging on for dear life, determined to produce some last jewelled berries before the frosts set in. And in the veg plots, I have two squashes that are still swelling in size. The pumpkin seems to have had a bit of a renaissance, suddenly producing lots of lush green foliage and surging its way up the wire mesh I’ve provided as a climbing frame. The butternut squash looks less healthy, and seems to be pouring all its energy into the single fruit that remains on the vine. I can’t quite remember a late October like this, and it’s been very therapeutic to just work out in the sunshine below a china blue sky. I have a feeling it could be the last sunny, warm and cloudless day we’ll see for quite a long time and I am so glad I wasn’t stuck inside all day missing it. 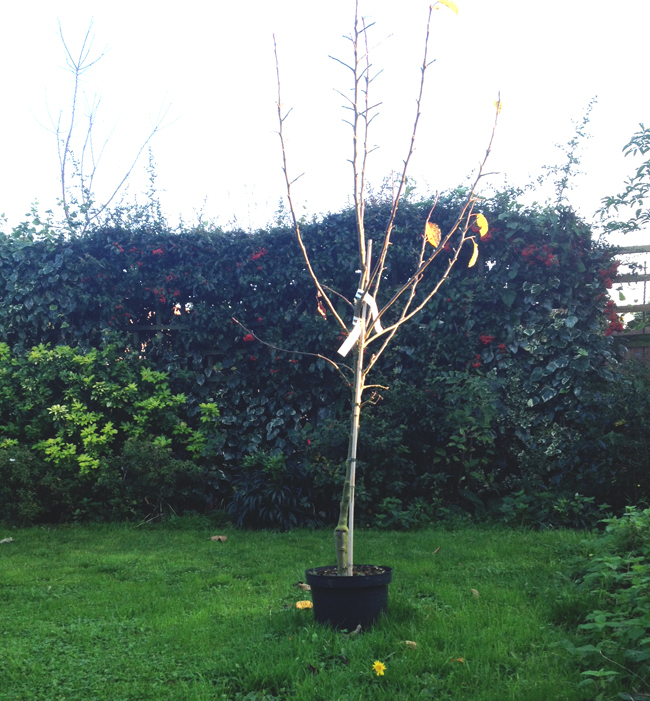 We still have two apple trees to plant and another to find to ensure that we have fertile collection of trees for next year! Late autumn and winter is a great time to get trees and large shrubs in the ground. As long as you can get a spade in, you should be fine to plant. With plenty of windy weather of late, there are lots of leaves to collect. Leaves can take quite a long time to break down amongst other compostables so leaf litter can be gathered and kept moist but not waterlogged in a container or bag to create crumbly leafmould for conditioning the soil in borders and veg plots. A purpose built leaf litter bin is great if you have lots of leaves to contend with, but for smaller gardens an old compost bag with breathing holes or a leafmould bag bought online should suffice. If you have a pond, make sure to regularly remove any leaves from the pond surface and cut back any marginal plants to avoid decay in the water. More advice for pond maintenance and water gardening here! 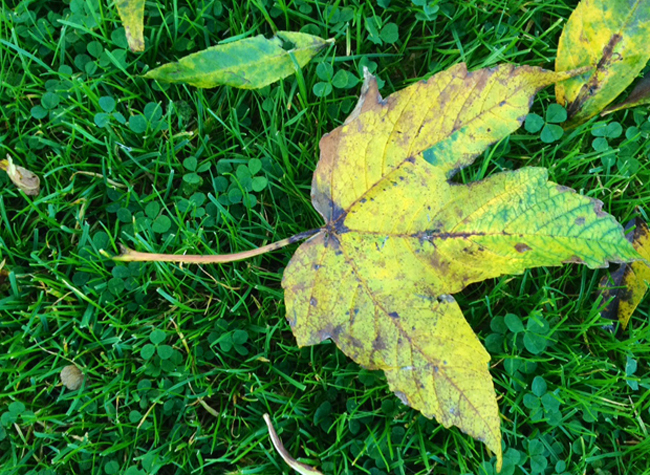 Don’t be too tidy – leave a few leaves on the ground for wildlife as leaves are great nesting material and cover. Autumn is a great time to dress your soil with at least a couple of inches of organic compost or well-rotted manure. In autumn, the soil is still warm enough so the worms will rise up and access the new material. Then over winter the weather will also help to break down any lumps in the compost or organic matter, and in spring the mulch can be raked in. NO need to dig! Luckily we kept on top of our hedges this year and as the days have shortened, the hedges have stopped growing so we’re ready for winter! We now have lovely dense hedging that will help keep the birds and wildlife protected in the bitter winter winds and temperatures. But if you’re a bit behind then October in particular is a great month to get those last cuts done before winter. The unseasonably warm weather has meant that we’re still mowing but soon it’ll be your last chance saloon before the ground gets too wet! Our heleniums exploded this year so we’ve got lots of dividing to do into new beds this autumn – free plants! Summer flowering perennials can be divided round about now – this includes our salvia, sedum, verbena, agapanthus and geraniums. With the soil still warm it’s a great time to get your flower beds laid out and really for spring, and in the veg plots the rhubarb crown can also be divided. Just get rid of any decayed or weak crowns, and then using a spade divide the crown at the root and replant.